The government has decided that a public inquiry into a big distribution centre off the A14 will not be necessary. 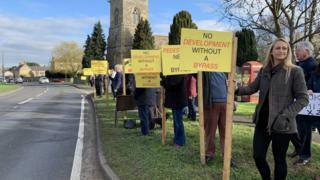 Local residents staged a protest when Kettering Borough councillors approved the plans for a 215,000 sq m warehouse near Isham, Northamptonshire, last month. They fear the warehouse will cause more congestion on already-crowded roads. Residents have asked for a bypass before the development takes place. The distribution centre, to be known as Symmetry Park, was originally rejected by councillors last year. But the plans were resubmitted after the council admitted it was unlikely to win an appeal. The government has decided that the development should proceed without any further investigation. Image caption One resident said building the warehouse without a bypass for Isham was "just ridiculous"
Plans for an A509 Isham bypass between Wellingborough and Kettering were approved in 2006, but they remain on hold because of delays plugging a funding gap. People living in the village, which has a population of about 800, estimate that 27,000 vehicles use the existing through road every weekday. In its application, developer DB Symmetry said it would seek to "minimise all unnecessary HGV movements assigning on the A509 through Isham, or on weight-restricted roads in the area". It said HGVs would be directed to use alternative routes away from Isham "unless having a bona fide reason to".